Vivek Bedi has worked in both corporate and startup innovation. His experiences range from positions at Goldman Sachs, to running his own company. 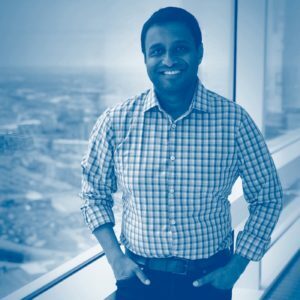 Now at Northwestern Mutual, Vivek is the Head of Consumer Experience, Digital Products, working in both New York and Milwaukee. Brian Ardinger, Inside Outside Innovation Founder, talks with Vivek about Northwestern Mutual’s digital transformation. Vivek’s team is responsible for everything digital that touches Northwestern Mutual’s 4.3 million clients. Three years ago, 150,000 of Northwestern Mutual’s customers used their digital products. Today, over 1.8 million customers are engaged in the digital experience. Pizza Pie teams – Developed small teams across two cities, tasked with one charter and putting something out every two weeks. Teams are virtual and cross-functional (product, design engineers and business) that have standup meetings every day.